It was a long way, full of difficulties and challenges, which led there that the childhood dream of Sir Zoltán Mága – the world-renowned violinist, Goodwill Ambassador of the Sovereign Order of Saint John of Jerusalem, Knights of Malta, Federation of the Autonomous Priories (KMFAP) – came true: this year Sir Zoltán met in person His Holiness Pope Benedict XVI. The “100 Church concerts” tour, which was a great artistic success and is considered an extraordinary humanitarian achievement, established Sir Zoltán's reputation, who is rightly reckons the meeting with the Pope as crowning of the concert series. Serious protocol negotiations and security preparations prevented the great event. But the big day finally dawned when Sir Zoltán travelled to Rome with his wife and two children, in a city where history really is in palpable nearness. 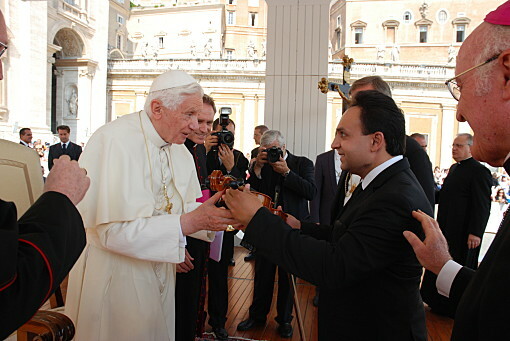 On the 28th September 2011 the au dience was held, which began at St. Peter's Square and continued in the Vatican. Sir Zoltán was present on behalf of Hungary and among numerous prestigious foreign guests. His Holiness greeted in Hungarian and sent blessings to all the people of Hungary, which was a heart-warming, and touching moment. After that the extraordinary meeting continued with music: first in string quartet formation, then Sir Zoltán was playing a Hungarian folk song on the violin to His Holiness, whose affinity for music is widely known. Sir Zoltán has often played this extraordinary scene in his mind, but even he – the experienced artist, who is accustomed to appearances – got excited in the Pope's presence when he played the violin. 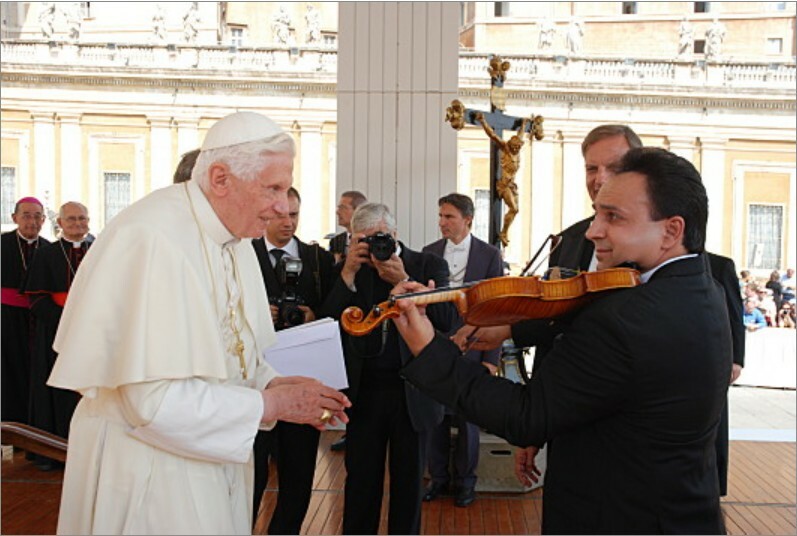 Sir Zoltán also brought a gift for the Pope, a master violin – as his personal emblem, which was handed over on behalf of Hungary. This day will remain forever among the most precious memories of Sir Zoltán, he remembers happily the journey to Rome, and considers himself and his family exceptionally lucky people. Sir Zoltán often talks about how his life began in deep poverty, and thanks to his talent, tenacity and generosity how high level he reached in regard of his artistic career and public recognition, only 37 years old. congratulations on your new success. You have exceptional performance and extraordinary accomplishment abilities, you work tirelessly and you are part of that small group of people, who do a lot for Hungarian society. We are very proud that you are member of Knights of Malta!